Here’s to all our good friends at the Robert Wood Johnson Foundation in Princeton, New Jersey who, as rumor has it, will be–or already have served these up to the fine people who work there! Nothing like a little (big!) chocolate chip cookie to inspire more research! Thanks for all you do! Enjoy the handful of happiness! The town of La Connor is nestled in the heart of the spectacular tulip fields of Skagit County in northwestern Washington State. Built on the banks of the Swinomish Channel, the town of La Conner is home to just under 1000 people, but welcomes over a million visitors each spring for the annual Tulip Festival. The main street–a mere three of four blocks long boasts numerous art galleries, restaurants and clothing shops. In and among all of that is the Wild Iris Inn and Bed and Breakfast–the first stop of many in a week-long trip to celebrate our 28th wedding anniversary. While the Inn itself was beautiful and very comfortable, the two cookies that were delivered as we arrived completely stole the show, and when we left the next morning, two more cookies were packaged in cellophane and tied off with a ribbon. Such a deal! 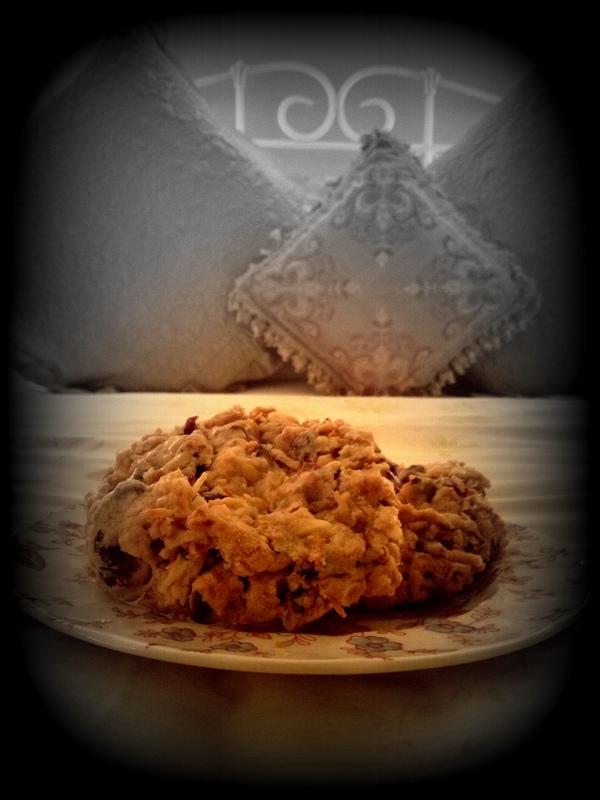 Anyway, a few days later and a couple e-mails to Lori Farnell, the gracious Innkeeper or the Wild Iris Inn, and the wildly ambrosial cookie recipe was mine! Thanks to Lori for the permission to share! In another much larger bowl, mix the flour, baking powder, salt and baking soda, then add the white chocolate chips, chocolate chips, coconut, cranberries, walnuts, rolled oats and the granola. Then add the wet ingredients to the dry ingredients and blend well. When well mixed, shape into golf ball sized balls and place on an ungreased parchment paper lined cookie sheet. Bake at 325° for 10 minutes or until just turning brown around the edges. When you pull the cookies out of the oven they will look like they are not quite done—and they will be flat and spread out. Take a spatula and gently round them out. After a few minutes, remove them from the cookie sheet and place them on a cooling rack. At this point, give them another “rounding” with the spatula which will give them some height. Let them cool to set. Subscribe to comments with RSS	or TrackBack to 'Wild Iris Cookies'. 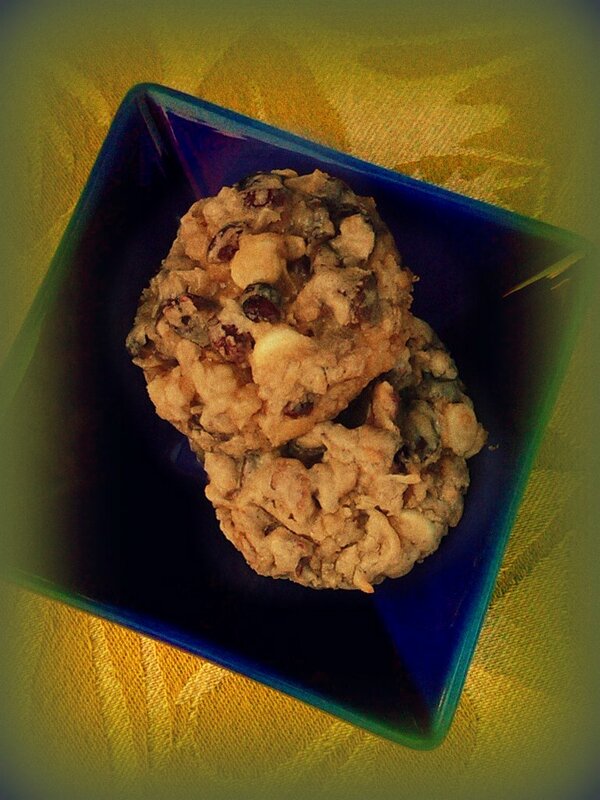 I’d like to enter my name in the drawing for a free batch of cookies, and/or topas on the veranda. Your name has been entered in the drawing. Good News: All are welcome, everybody’s a winner! I had the pleasure of staying at the Wild Iris Inn and the cookies were remarkable. The owner gave me a copy of the recipe, which is just as it is above. He also gave me their recipe for the granola they use in the cookies. I hope he doesn’t mind that I share. I cut the recipe down to a home kitchen size. Thanks for this– I do appreciate you taking the time to add to the cheer here! Indeed, remarkable cookies. We made such a fun fuss about the cookies that when we left the next day, the owner gave us each two more each! It was just nuts! Great hospitality, a breat B&B, a cool little town. Good stuff, for sure. Absolutely the best cookies!! Just came back from staying at The Wild Iris again and the cookies are the first thing you see when you walk into your room. Yummm This is one of the best B & B’s we have stayed at and the owners are so gracious. Try the cookies and stay at the Wild Iris in La Conner, Wa. We love these cookies too! To make them glutten free just add an extra egg and I use the glutten free flour from Costco. 🙂 Yum! La Conner a town look like I had step into a Scene out of a Movie such serenity. And what was so amazing there in our room was the most delicious cookies that I had to have the recipe even though I’m far away I had to have something to remind me of that special night and thank you Wild Iris Staff for the recipe. I’m going to top these cookies almost as good as yours to share with my friends and family. Again thanks for everything. I know I will be visiting again.